St. Gaspare founded the Society of the Precious Blood in Giano, Italy, on August 15, 1815. Here, in the 10th century abbey of San Felice, he opened the gates of an ardent devotion to the Precious Blood of Christ. Impelled by the love of Christ, manifested especially in the shedding of his Blood, and sensitive to the needs of the Church, St. Gaspare del Bufalo founded a priestly institute. He attracted from the diocesan clergy a group of like-minded priests, and he unified them by a bond of charity only, instead of vows. Living together in mission houses, they were a source of continual renewal for the priests and the people, mainly by preaching missions and retreats. 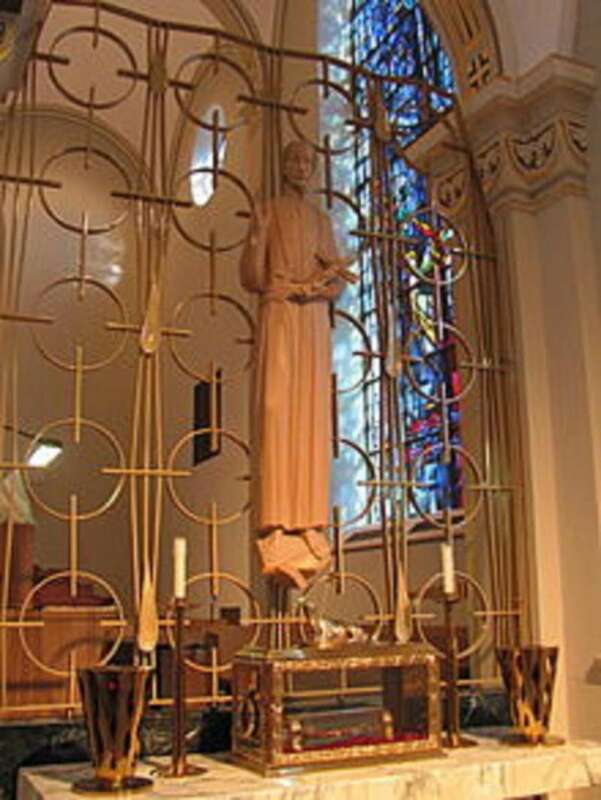 In this nucleus the Society of the Precious Blood had its origin, and from it, derives its spirit. Gaspare was born in Rome on January 6, 1786. His father, Antonio, was a servant in the family of a prince. He was a pious man of firm faith who was a staunch defender of the Holy Father. Gaspare’s mother, Annunziata, was one of those quiet and saintly women who seemed to model her life and faith after the holy women of the Scriptures. She realized early in Gaspare’s life that God had great things in store for him. She raised her son in virtue and holiness, readying the soil for God to plant within Gaspare a deep and abiding devotion to the Blood of Christ. The artifact is a signed manuscript of Saint Gaspare del Bufalo, written in 1820 from Foligno, an ancient town of Italy in the province of Perugia, to Fabrica di Roma, a commune in the province of Viterbo. Saint Gaspare was born in Rome on January 6, 1786 and died there in 1837. He was a priest and founder of the Congregation of the Missionaries of the Most Precious Blood. Pope Pius X beatified him in 1904, and Pope Pius XII canonized him in 1954. The letter is in nearly perfect condition with minimal creasing on the single sheet of paper, which can be seen in the photo. It is an excellent addition to the Papal Artifacts Collection of items belonging to or associated with the Saints & Blesseds. Early in his life, Gaspare showed a great concern for the poor and sick. 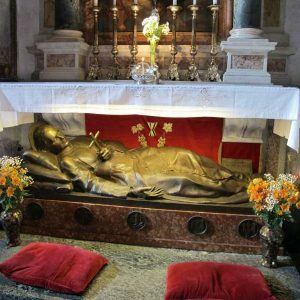 Perhaps because he came from a family of meager means, and because he himself had been a sickly child (almost dying at the age of two, only to be cured through the intercession of St. Francis Xavier), Gaspare’s compassion for the poor and outcasts consumed him. He spent his summer vacations as a youth visiting hospitals and bringing meals to the hungry. When he was eighteen, Gaspare exhibited one of his greatest gifts: organizing for action on behalf of the people on the fringe. 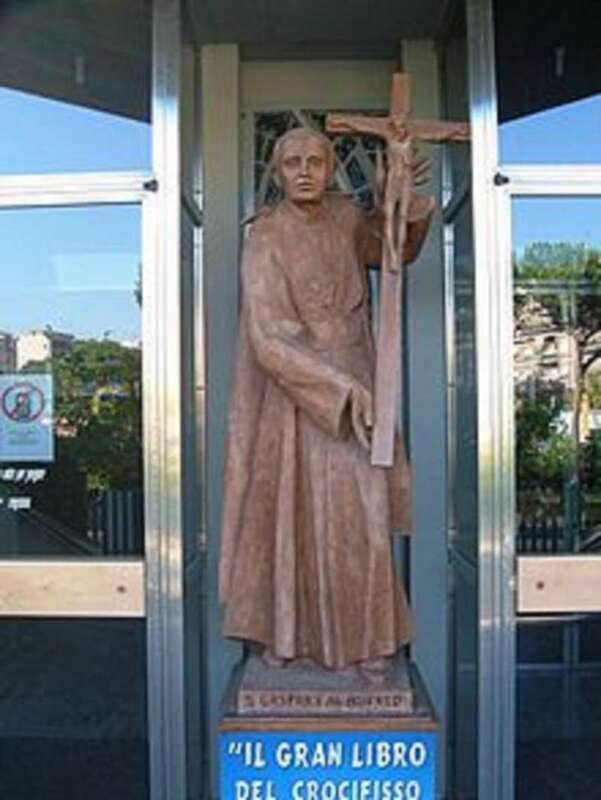 Together with some of his classmates, Gaspare ministered to the marginalized by offering religious instruction to the peasants from rural areas who came to Rome to sell their hay, and by providing catechism classes for orphans and children of the poor, and by setting up a night shelter for the homeless. Gaspare was ordained July 31, 1808. Less than a year later, on May 17, 1809, Napoleon suppressed the papal states. Pope Pius VII was arrested and transported to Savona. On June 13, 1810, Gaspare was brought before the magistrate to take the oath of allegiance to the emperor. In words that echo the Gospel of John when Jesus said, the truth will set you free, Gaspare told the magistrate, I would rather die or suffer evil than to take such an oath. I cannot. I must not. I will not. For the courage of his conviction, Gaspare was sentenced to prison. But even though his body was incarcerated, the truth had set his spirit free. Although the conditions of the prison caused his health to deteriorate, his mind and heart continued to expand. A dream was about to be born. During his exile, Gaspare’s compassion deepened. 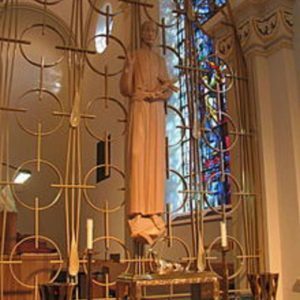 Though he had been about works of mercy for most of his life, in the silence of his cell this work was clearly defined by the Precious Blood of Christ. In the solitude of exile, the vision became clear: to continue the works of mercy and the evangelization in the context of community. He would join forces with other men and women united in the bond of charity to touch others with the redeeming grace of the blood of Jesus. Napoleon was defeated in January 1814, and Gaspare was free to return to Rome to begin his mission as apostle of the Precious Blood. He had spent four years in exile and imprisonment, but his enthusiasm had not waned. He came back to a city, however, that was in chaos. In the aftermath of Napoleon’s occupation, the Church in Rome was experiencing great trial. So the pope appointed Gaspare to preach missions throughout the city and the surrounding countryside for the spiritual renewal of the people. In response to the Holy Father’s request, Gaspare drew upon the rich resources of two of his mentors, Frs. Albertini and Bonnani, to begin the society of apostolic life. It was Gaspare’s vision to wed the spirituality of the Precious Blood with the concept of a community for the apostolic works of mercy. This sacred union gave birth to the Society of the Precious Blood that would proclaim peace through the blood of the cross. St. Gaspare brought devotion to the Blood of Christ out of the sanctuary and into the streets. His preaching was rooted in the saving act of Christ on the cross, and so he carried the crucifix close to his heart. Indeed, the mission cross became the symbol of the newly formed community. Gaspare’s words and witness became the wings to lift the burden of sin from the hearts of his listeners. He called people to reconciliation–to restore a right relationship with God and others. The power of Gaspare’s presence and preaching was found most dramatically in his work with bandits. The year was 1821, and at that time there was a severe problem in the papal states. The bandits had control over many of the towns in the coastal provinces. It was a time of great lawlessness and many towns were out of the control of civil authorities. One town, Sonnino, was so bad that the government had given up completely. It had become so desperate that they decided to destroy the whole town. The people were supposed to move out, although they were to be compensated for their loss of property, and the plan was to level the town. A number of houses were demolished before the people’s outcry forced the authorities to stop. Sonnino was just one of many problem places. At that time there was a Cardinal Cristaldi who was a great admirer of St. Gaspare. He was also the papal treasurer and advisor to Pope Pius VII. He had a plan, which he presented to the pope, to deal with the bandits. His plan was to fight the immorality and savagery of the bandits, not with weapons, because that had been tried and failed, but with spiritual forces. He suggested that St. Gaspare and his new band of missionaries go into the towns and provinces where the bandits lived and establish mission houses. There they were to preach the Word, establish churches and chapels, and see to the continued instruction of the people. And that is what the young missionary society did. Between 1821 and 1823 six new mission houses were opened. Each house was to have five missionaries and each team was to conduct 12 missions a year. In that way every town would hear the message of redemption and reconciliation during a two year cycle. From these houses St. Gaspare and his companions went out and preached the merits of the Precious Blood. They called the people to repentance and to return to faithfulness. They would preach on the street corners at night. They instructed the children. Armed with only the crucifix, they went into the hills to seek out the bandits to win them over. Crazy—but it worked. In two years the bandit problem was under control. Gaspare was well loved by those who had encountered his ministry, and he was very popular in his native city. 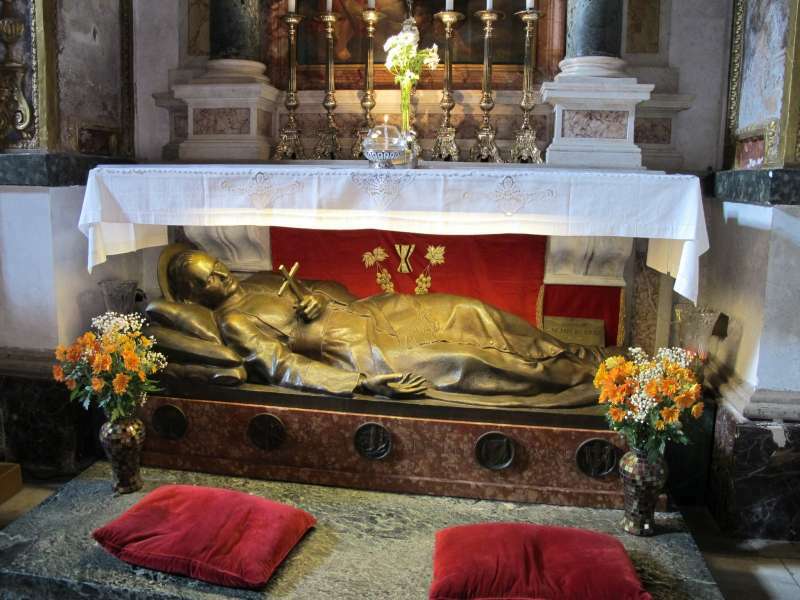 To this day he remains a popular hero in Rome, and devotions to the saint are very popular. However, Gaspare and his young society encountered substantial opposition within the political workings of the Church. One major objection to the new society was that its name, The Society of the Precious Blood, was considered unecclesiastical. Gaspare was accused of disregarding Canon Law and the mission cross and chain that the members wore was completely untraditional. This opposition began under the reign of Pope Pius VII (around 1820) who had been a strong supporter of the society at its founding in 1815. This opposition became so strong that the successor to Pius VII, Leo XII, was positively adverse to the community. It is noted that this was at a time when Gaspare was being more and more open in his criticism of abuses in the Church and the government of the Papal States. St. Gaspare felt that this opposition was more of a personal attack on himself and so he offered to step down as moderator of the community so that things could be smoothed over. Fortunately, this was not needed as the situation with Leo XII was resolved after a meeting between the two of them. This was not the end of Gaspare’s difficulties. The enemies of Gaspare merely changed their tactics to trying to have him removed from Rome. First they tried to have him made a bishop. This Gaspare begged to be excused from. Then they tried to have him removed from Rome by having him named Inter Nuntius to Brazil. It was a very difficult time for Gaspare until his refusal was accepted. Finally Leo XII appointed Gaspare to the Congregation for the Propagation of the Faith, which required his residence in Rome. After Leo XII died in 1828 the enemies of the community went to work on his successor, Pius VIII. Pius VIII believed all the old accusations and treated Gaspare very severely in a private audience. He removed all the privileges for the community from him, including all the financial help that had been assigned for mission work. It is a testament to Gaspare’s conviction that the community was inspired by divine will, that this was not the end of the community. 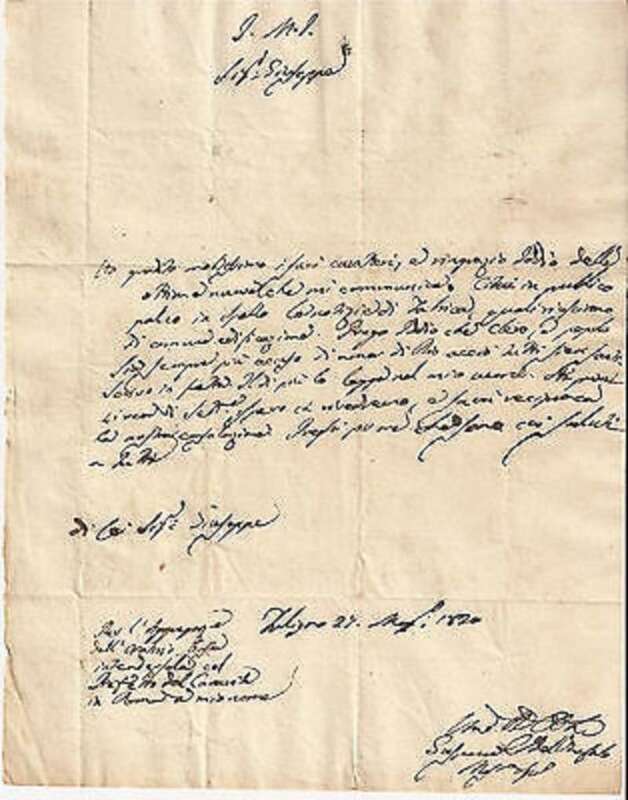 Instead, Gaspare withdrew to one of the houses and drew up a document giving legal proof of the legitimate existence granted to the community by Pius VII. The opposition continued throughout the life of Gaspare and the Rule was not approved until after his death. Gaspare died on December 28, 1837. The medical report called him a “victim of charity” because even though he was in ill health himself, he ministered to the victims of the cholera epidemic that broke out in Rome. 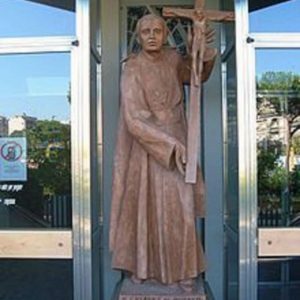 Gaspare was beatified in 1904 and canonized a saint on June 12, 1954. Papal Artifacts gratefully acknowledges EWTN for this biographical information.